Peacocks have feathers; elk have antlers; and dads -- the natural-born jokers of the animal world -- have puns, just as Mother Nature intended. When a dad's pun superiority is challenged, the established order inevitably faces upheaval, sometimes violently so. At least that's how College Humor explains it in its Ultimate Dad Joke Duel, "Live by the pun, die by the pun." Watch out, dads, this pun-off gets real ugly, real quick. Who left dad unsupervised at the grocery store? Historical dad joke. How highbrow. How much time did you spend making that...? "What do you call a belt made out of a watch? ...a waist of time." 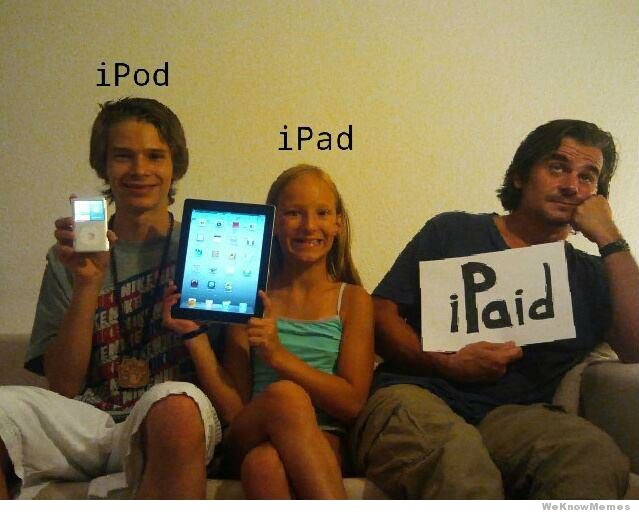 Apparently, iPad jokes are big with the dad crowd. "[My dad] enjoyed bringing people into our basement just to tell them to duck."